We help nonprofit organizations use the best tools to increase and manage fundraising, so they can give back more. Average improvements reported by Salesforce. Companies all over the world use Salesforce to increase their sales, which makes Salesforce the No. 1 CRM system in the world. As a Nonprofit, you can use the same tools to increase donations, retention and engagement, all while improving your organization’s efficiency. OK, that’s a good deal! From Salesforce’s “Power of Us” program, nonprofits get 10 free subscriptions and discounts on additional Salesforce subscriptions, products, and services. Build your donor and volunteer journey, from prospect, to lead, to opportunity, to donor/volunteer, and nurture them along the way with automated communication specific to each stage of that journey. Follow your progress with easy to read dashboards that enable you to adjust initiatives based on success. You can also share best practices with other nonprofits that use Salesforce via the “Program of Us” user groups, which are active in most big cities in North America. 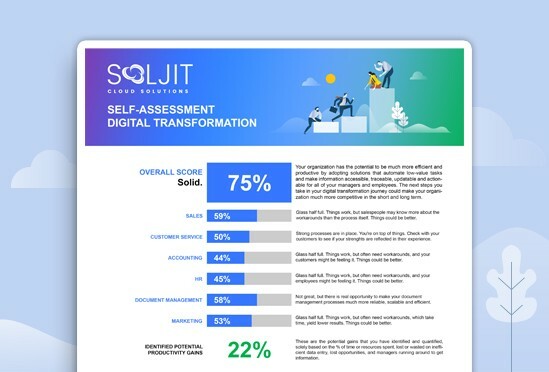 Why work with SOLJIT for Salesforce? SOLJIT has been doing Salesforce projects since 2011. We are a Silver Consulting Partner of Salesforce and a Salesforce.org Registered Partner. We’ve helped all kinds of nonprofits involved in many sectors, from education and environment to health and wellness. Our team boasts Salesforce certified business analysts and developers, to ensure that you get the most out of your solution, from project kick-off, to implementation, to handoff. Although most of our projects are full implementations, our Salesforce service packages are flexible and include time blocks, which can be used for support or for the continuous improvement of your systems. Quickstart packages are designed to get you up and running with a standard Salesforce implementation in days. Although these packages have limited options, they do include business analysis, project management, some level of customization, basic dashboards, data import and training.